This recipe is an excellent source of protein, vitamin B6, vitamin B12, selenium and zinc; and a good source of niacin and iron. Cut beef steaks into 1-1/4- inch pieces. Combine marinade ingredients in medium bowl. Remove and reserve 2 tablespoons for salsa. Add beef to remaining marinade; toss to coat. Cover and marinate in refrigerator 30 minutes to 2 hours. Remove beef from marinade; discard marinade. 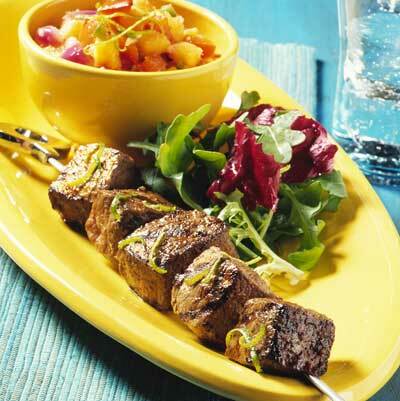 Thread beef pieces onto six 10-inch metal skewers, leaving small space between pieces. Alternately thread fruit and vegetable pieces evenly onto six 10-inch metal skewers. Place fruit and vegetable kabobs on grid over medium, ash-covered coals. Grill, covered, 12 to 15 minutes or until vegetables are tender, turning occasionally. Remove; keep warm. Place beef kabobs in center of grid. Grill, covered, 5 to 7 minutes (over medium heat on preheated gas grill, 7 to 9 minutes) for medium rare (145 degrees F) to medium (160 degrees F) doneness, turning occasionally. Remove fruit and vegetables from skewers; coarsely chop. Combine with reserved marinade, lime peel and 1/2 teaspoon salt in medium bowl. Season beef with salt and pepper, as desired. Serve with Pineapple Salsa. 1 1/2 pounds beef shoulder center (Ranch) steaks, may be substituted for beef top sirloin steaks.